Richard Paige — What’s it like to sit down in a theater and see your story on the silver screen? The he in question is writer/director Russell Harbaugh ’06. Those notes led to Love After Love, a movie that looks at how a family deals with the loss of its patriarch, an experience Harbaugh knows well. The story is loosely based on the passing of Russell’s father, Glenn, and how his mother, Patti, learned to carry on. It’s a story Russell has been tinkering with for 12 years, a span that covers the time since graduating from Wabash. And now that the film has been released to critical acclaim, there are questions being answered for Patti as well. 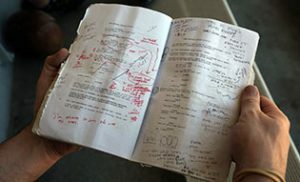 Russell Harbaugh ’06 holds his script for “Love After Love,” complete with his notes scribbled in the margins. Patti talks of her own struggles with moving on, feelings of betrayal, and making connections. She also found comfort in her son’s ability to take a nugget of their conversation and turn it into a scene in the movie. Not a direct link, but certainly an emotional one. Patti, a longtime costume designer and member of the theater faculty at the University of Evansville, is proud that her son embraced the power of art, and remembers fondly when that power might have been unleashed. Love After Love opens nationally Friday. After a dozen years of conversation, of tinkering, of finding just the right voice, it’s now a story to share broadly. Patti sees her son at ease with the attention the film has brought. She sees it as a gift. He’s brilliant,” she laughs, “I’m his mother, so I can say he’s brilliant, right? I’m wowed by the art of the film. Associate Professor of and Chair of Psychology Karen Gunther wanted to be an artist when she grew up. In junior high, she decided she was better suited for science or math, but she never let her creative side wane. After knitting and sewing with both of her grandmothers almost her entire life, Gunther picked up quilting while studying biopsychology at Oberlin College. Gunther says it’s fun “immersing” herself in color, and her passion for her work even extends to her personal life. 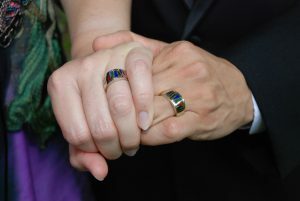 The wedding rings for her and her husband, who is also a vision scientist, were designed based on their field of study. Coral, chrysoprase, and lapis stones were used to symbolize the three cones found in the retina – red, green, and blue, respectively. Onyx lines are on the sides of their rings, which are similar to the stimuli the couple uses in their research. After recently receiving a grant worth more than $200,000 from the National Science Foundation, Gunther’s research is about to expand. The grant will fund three years of research, as well as summer interns for Gunther, but it was a long process to get to this point. Gunther applied for the grant in August 2017. 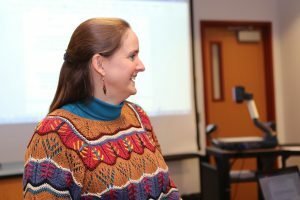 In early December, she received an email from the NSF that she had not uploaded a title slide for her grant. And though the waiting period was long, Gunther said she never stressed.